We're privy to a special IDF this year, it's the 10 year anniversary of the conference and Intel is understandably excited. The show started off with Intel's President and CEO, Paul Otellini giving us a broad update on the company and its roadmap. Otellini confirmed what we already know, that Intel's 45nm process will be the enabler to bring us technologies such as integrated graphics on CPUs (similar to AMD's Fusion strategy), octo-core CPUs, system on a chip designs and a highly parallel x86 design that we've come to know as Larrabee. Silverthorne is Intel's very simple x86 system-on-a-chip design, which will hopefully make its way into everything from smart phones to digital TVs. UMPCs may also use Silverthorne for particularly mobile form factors, hopefully fixing many of the problems with today's UMPCs. 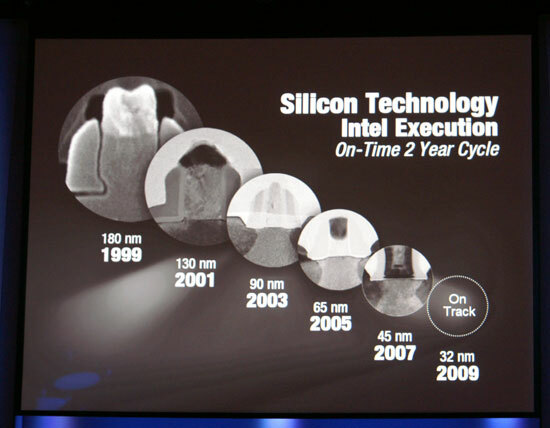 Intel confirmed that its manufacturing expertise is still strong and that it fully expects to introduce the first 32nm products in 2009, just two years from now. 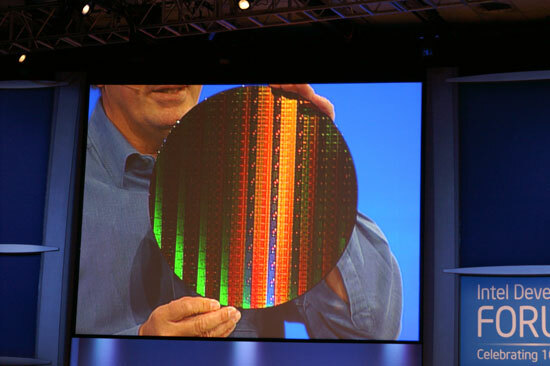 As always, when you're bringing up a new process you want to try manufacturing simpler devices first and thus Intel showed off a SRAM wafer built on its 32nm process. Each die on the wafer had a 291Mbit SRAM composed of an incredible 1.9 billion transistors. Penryn is coming, we've previewed it already and we should get more performance data at the show. 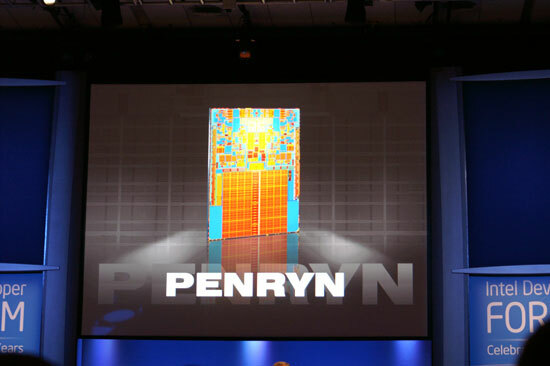 The official launch date is November 12th, and Penryn is the first of 20 microprocessors being developed on 45nm. The introduction in November will be for servers and high end desktops, followed by a mainstream release in Q1 2008. Intel also confirmed that its 45nm processors and the 65nm chipsets that support them will be Halogen free as well as Lead free. Intel didn't have much to say about the architecture other than it was called Kenmore and we'd see it in 2008 in the Consumer Electronics market. seems like intel could come up with a more creative name than that. Looks like current trends will continue for the near future. 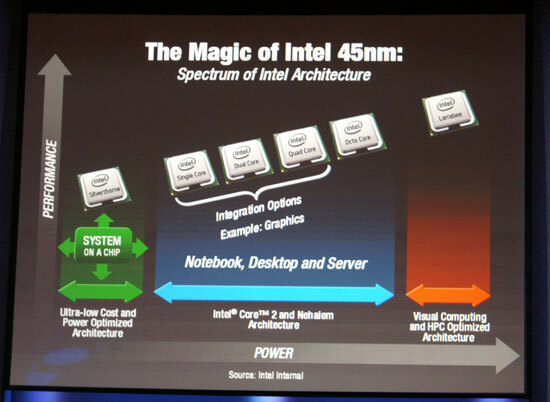 Both AMD and Intel are heading in similar directions: new architecture on 65 nm, same architecture on 45 nm, and then a brand new architecture that is highly parallel and a large divergence from CPU designs of today. And, just like today, it appears Intel will get to that new architecture at least a half year if not a full year ahead of AMD. Glad to see things accelerating so quickly in the CPU market, as long as AMD DOES keep catching up we should be okay!